My Men Are My Heroes introduces its readers to a living standard of Marine Corps esprit de corps and military decorum. Sergeant Major Bradley Kasal, the pride of Iowa, is a small town boy who wanted to be a United States Marine even before a poster perfect Marine recruiter marched into his high school gym and offered him a challenge Kasal couldn't resist. Two decades later Kasal stood stiffly at attention, one leg literally shot in half, while the Navy Cross was pinned to his chest. Kasal was the Sergeant Major of the Infantry School at Camp Pendleton, CA until he retired in May, 2012. After a brief visit to his childhood Kasal's story quickly gathers steam, introducing the reader to his early Marine career; adventure filled years that earned him the name "Robo-Grunt" from men who don't offer accolades easily. Kasal uses his experience climbing the ranks to illustrate how Marines grow, and how they are shaped by the uncompromising attitudes of the officers and non-coms charged with turning young Marines into tigers. Kasal's adventures culminate in Iraq. By now he is 1st Sergeant Kasal, ramrodding Kilo Company, 3/1, a rifle company in 3rd Battalion, 1st Marines, the mighty "Thunder Third" that would cover itself with glory in 2004. Two days into Operation Iraqi Freedom in March 2003, Kilo is ordered to hold open a critical road between two bridges that Saddam's fierce Fedayeen Saddam were just as determined to take away. Kasal makes in his stand on that road, literally standing tall amidst fierce gunfire, demonstrating the kind of leadership Kilo Company needed to get the job done. Kilo's fight was part of the first big test of Marine Corps combat capabilities in the second Iraqi War and the only major engagement the Marine Corps fought during the heady days of the "Drive Up" to Baghdad. When it was over the so-called "Ninjas" of the Fedayeen Saddam were smashed. A week later Kasal was in Baghdad, welcomed with open arms by the exuberant population. A year later 3/1 was back to Iraq, in Anbar Province, the epicentre of the brutal war now raging in the former tribal stronghold of Saddam and his henchmen. The smiling faces that had greeted 3/1 the year before were gone. Kasal is the 1st Sergeant of Weapons Company, 3/1, the armoured fist of a light infantry battalion. After four months of ambushes, IEDs and deadly skirmishes 3/1 is ordered into Fallujah, to take the ancient city back from Al Qaeda and the foreign fighters who had turned the ancient "City of Mosques" into a fortress. It is there, in November, 2004 that the "Thundering Third" entered into Marine Corps legend and Kasal into the Pantheon of Heroes for his actions during the most savage battle the Marines fought in the Iraq War. At a non-descript house in a walled neighbourhood in Fallujah, Kasal, at the time accompanying a squad of Kilo's riflemen into a contested house, becomes involved in a close-quarter duel with fanatical Chechen fighters. The fight rages throughout the house, at times Marines and the foreign fighters were exchanging rifle fire and grenades at ranges of less than 10 feet. For almost two hours the squad is trapped inside the house. 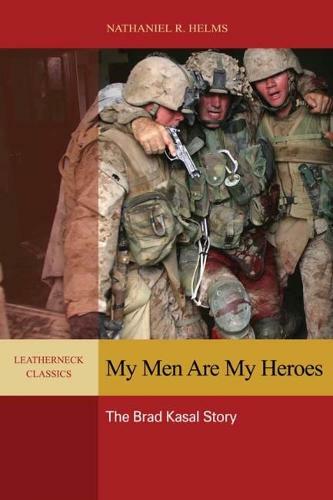 During the brawl Kasal is shot seven times, almost loses his leg when it is nearly severed from his body, and sustains 47shrapnel wounds when he used his body to shield a wounded Marine laying next to him from an enemy grenade. In the skirmish, forever known as the "Hell House" fight, Kasal was awarded the Navy Cross, the nation's second highest award for heroism.